Sheffield United's promotion hopes were dented as Dany N'Guessan's late penalty earned Port Vale victory. Ben Williamson's flick gave Vale the lead before Blades captain Chris Basham was sent off for fouling Michael Brown. Jamal Campbell-Ryce equalised from 10 yards but N'Guessan settled the game from the spot after Bob Harris brought down Mark Marshall. The Blades are sixth, 11 points off an automatic promotion spot, while Vale are four points off the top six. "I thought we deserved something out of the game. A couple of decisions went against us which seems to be the way at the moment. "I didn't think it was a sending off which I thought altered the course of the game. "The two or three chances we had in the first half, we have to score from one of those. " Match ends, Port Vale 2, Sheffield United 1. Second Half ends, Port Vale 2, Sheffield United 1. (Port Vale) wins a free kick in the attacking half. Foul by Jay McEveley (Sheffield United). Corner, Sheffield United. Conceded by Carl Dickinson. Attempt missed. Michael Brown (Port Vale) right footed shot from outside the box is too high. Corner, Port Vale. Conceded by Jay McEveley. Substitution, Port Vale. Colin Daniel replaces Dany N'Guessan. Substitution, Sheffield United. Marc McNulty replaces Harrison McGahey. Goal! Port Vale 2, Sheffield United 1. Dany N'Guessan (Port Vale) converts the penalty with a right footed shot to the top right corner. Penalty Port Vale. Mark Marshall draws a foul in the penalty area. Penalty conceded by Robert Harris (Sheffield United) after a foul in the penalty area. Substitution, Port Vale. Chris Lines replaces Louis Dodds. Richard Duffy (Port Vale) is shown the yellow card. Foul by Richard Duffy (Port Vale). Chris O'Grady (Sheffield United) wins a free kick in the defensive half. Substitution, Sheffield United. Louis Reed replaces Stefan Scougall. Foul by Jamal Campbell-Ryce (Sheffield United). Corner, Sheffield United. Conceded by Adam Yates. Attempt blocked. Jamie Murphy (Sheffield United) right footed shot from the left side of the box is blocked. Corner, Sheffield United. Conceded by Frederic Veseli. 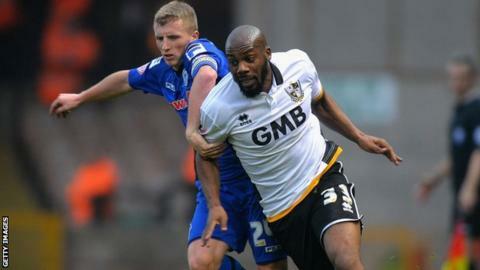 Louis Dodds (Port Vale) is shown the yellow card. Jamal Campbell-Ryce (Sheffield United) wins a free kick in the attacking half. Mark Marshall (Port Vale) wins a free kick on the left wing. Foul by Michael Doyle (Sheffield United). Attempt saved. Michael O'Connor (Port Vale) left footed shot from outside the box is saved in the centre of the goal. Attempt saved. Stefan Scougall (Sheffield United) right footed shot from outside the box is saved in the centre of the goal. Foul by Dany N'Guessan (Port Vale). Robert Harris (Sheffield United) wins a free kick on the right wing. Goal! Port Vale 1, Sheffield United 1. Jamal Campbell-Ryce (Sheffield United) right footed shot from the centre of the box to the centre of the goal. Assisted by Jamie Murphy. Attempt missed. Louis Dodds (Port Vale) header from the left side of the box is close, but misses to the left. Dany N'Guessan (Port Vale) wins a free kick in the defensive half. Attempt missed. Michael O'Connor (Port Vale) left footed shot from outside the box is just a bit too high.